The weather was not cold and quite refreshing this past Sunday, and so my partner and the kids decided to have an impromptu barbeque and harvest some of our permaculture garden‘s bounty. My almost-four-year-old son was intrigued enough to join me for negotiating the kale plants and crawling the tomato jungle to extract the ripe specimen. 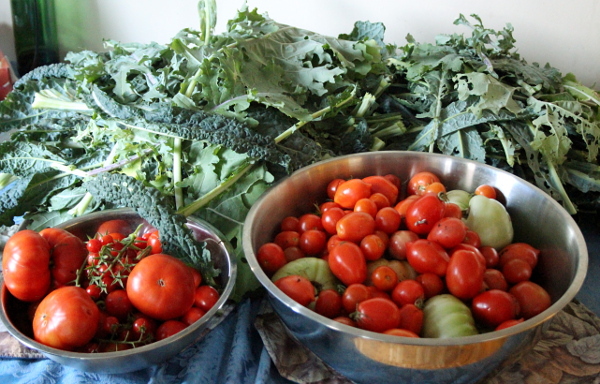 We ended up with two large heaps of kale and two large bowls of tomatoes. 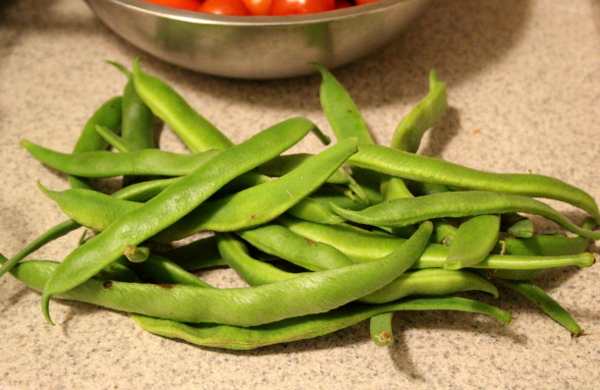 As my son and I have collected our treasure, the sausages were ready, and we sat down to a simple supper of sausages, steamed broccoli, cauliflower, carrots, hummus, stir-fried green beans with onions, and fresh cherry tomatoes just off a bush. 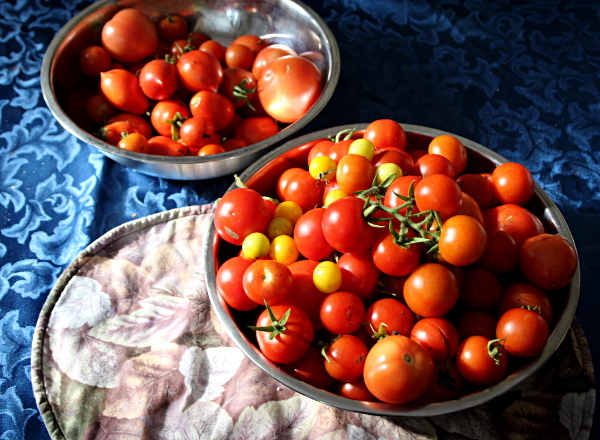 Once the supper was done, I have set out to wash and sort tomatoes. The split ones went directly into the blender for a cold tomato soup. As I didn’t have cucumber or celery this time, I have put in some bok choy leaves I had in the fridge. All the ingredients were piled up in the blender, ready to be refrigerated until the next day, when it took one minute for me to get a freshly-blended cold tomato soup for lunch. 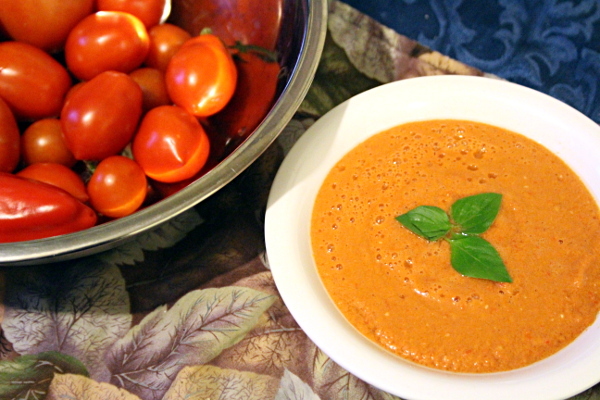 After the sorting and putting the split tomatoes aside for the soup, I have ended up with two bowls – one with large beefsteak tomatoes, only some of them ripe, and a full heaping bowl of smaller, cherry, and plum tomatoes. The beefsteak tomatoes were so heavy that most of them were lying on the ground, to the sheer pleasure of various slugs and bugs. I have made an executive decision of ripening them off the vine, so as to have a chance at us, and not the bugs, consuming them. Three of these tomatoes were quite ripe, however, and so I have made a simple pasta sauce guided by the following recipe. 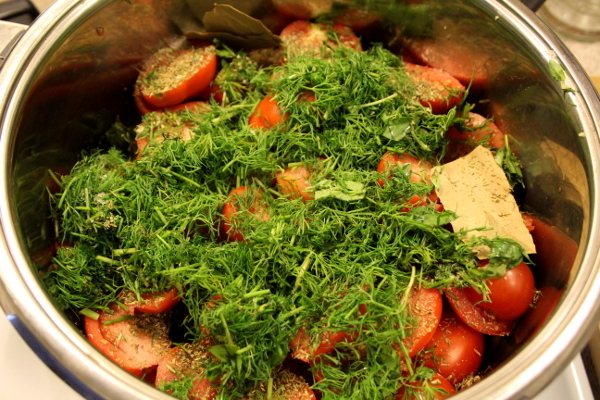 I have substituted some of the herbs, adding dill (as I had a lot of it) and lots of fresh basil from the garden. The pasta sauce came out delicious and I have frozen several containers of it for the future. 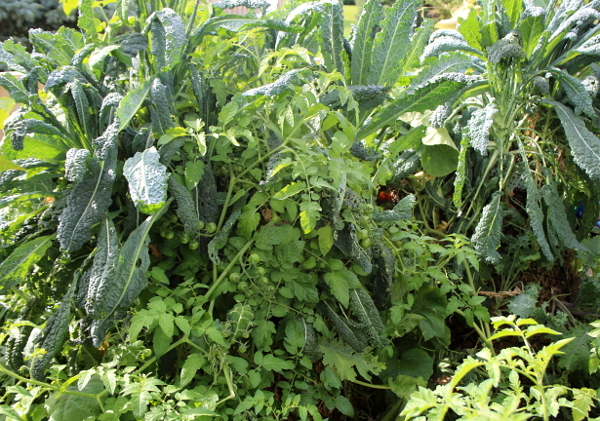 I have decided to freeze most of the kale for future use in smoothies, soups, and salads, and to put aside an equivalent of a store-bought bunch of kale to make a kale quinoa salad. The kale freezing process involved stripping kale leaves of the hard veins, ripping them into smaller pieces, and washing them. 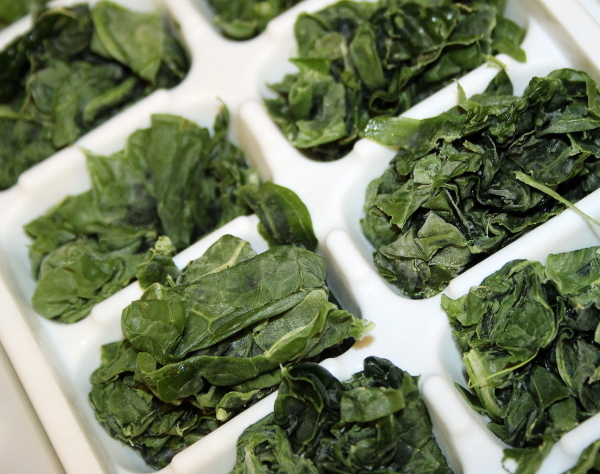 This was done in batches, followed by blanching the washed leaves: throwing them into boiling water for about 3 minutes, dunking them into an ice bath with a slotted spoon, draining them, drying them a bit, and then stuffing them into ice trays. Once they were frozen, I have popped them out, sorted them into zip lock bags, and placed them in the freezer. The two large heaps of kale resulted in just under 6 ice trays and a salad. 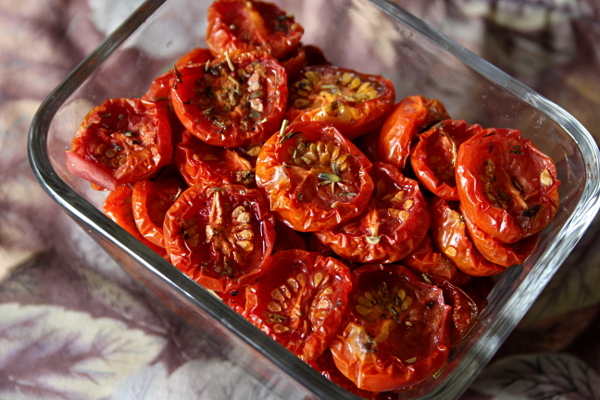 For the large quantity of smaller tomatoes, I have decided to make oven version of sun-dried tomatoes. They came out delicious and I have since been adding them as toppings on salads and hot dishes. 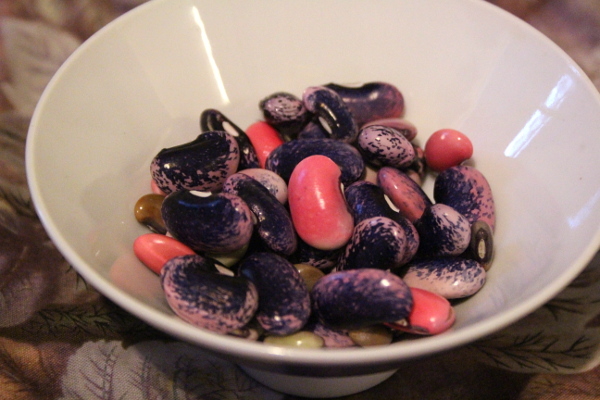 Inspired by my tomato and kale adventures, the next day I have gathered some of my scarlet runner bean pods — those that looked the most full and ready. There are still a few ripening ones, so I have left them for later. I have then peeled them and will be following the instructions from EarthEasy to dry and save them for seeds, as there are not that many of them. The garden is beautiful, and it is a pleasure to spend time surrounded by its lush greenery. 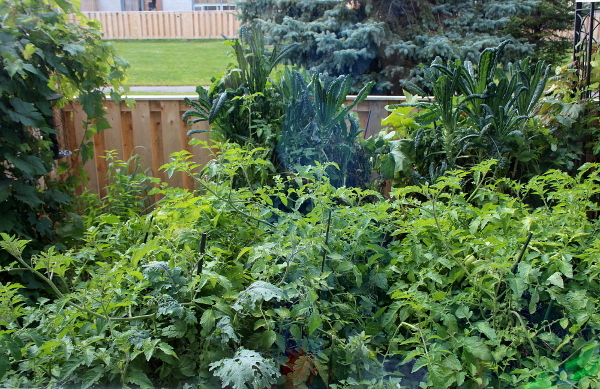 Being in the midst of the leaves whispering in the wind, butterflies and buzzing beetles zooming about, birds chirping at the bird feeder, and ripe fruit hanging in the depths of my tomato forest, gets me breathing deeply, letting go of fatigue, and feeling grateful for this green ecosystem full of life, on my doorstep. After some time we had without power, I refused to go back to the electronic world. Instead, I took the baby into the garden, and she happily played while I dodged tomato branches and searched for hidden ripe treasures in the jungle that my garden has become. In the process, I have discovered a ripe red Romanian pepper, quite a few Thai hot peppers – still green but promising, two surprise butternut squashes (and by “surprise” I mean that as I was looking for tomatoes, I have bumped into a squash hanging from a tower), lots of kale, and an abundance of scarlet runner bean pods. My tomato jungle did not disappoint. I have discovered lots of tiny red grape tomatoes, larger red cherry tomatoes, tiny yellow tomatoes, plum tomatoes, and large red tomatoes. Lots are still in the ripening stage, but I was able to gather about a bowl and a half just by picking those that were already so ripe they couldn’t hang on anymore. 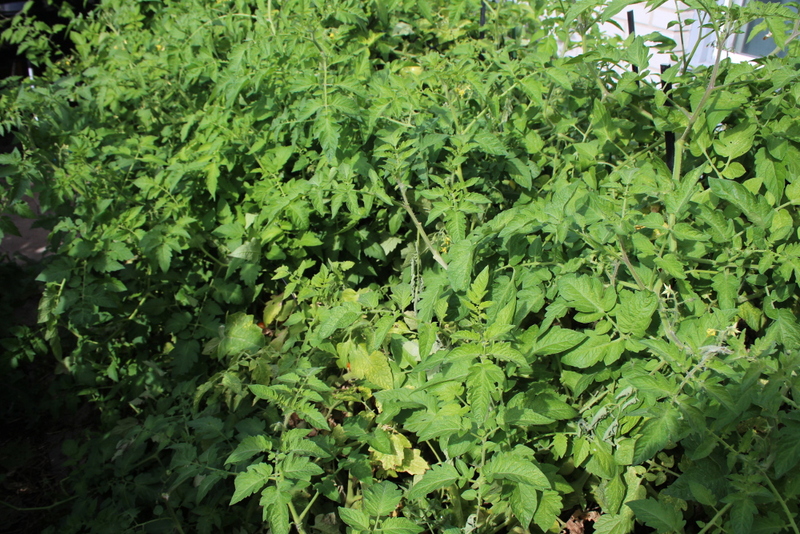 Quite a few overripe tomatoes are on the ground – the sacrifice to the fauna of the garden, which is joyfully munching on the cast-aways. The birds have discovered the bird feeder and made it their own. Not a day goes by without me seeing quite a few there, happily partaking in the sunflower seeds. 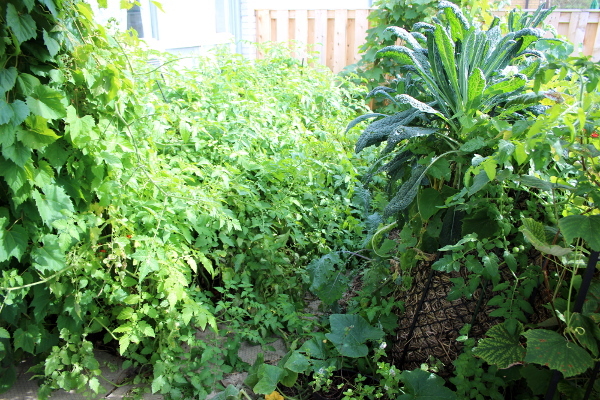 Some of the plants are trying to bail from the garden: the beans, the tomatoes, and a squash have surpassed the boundaries and are running wild on the other side of the fence. Surprisingly enough, people who cut grass in the common area have been very gentle so far and have worked around the escapees. As I was making my way around the towers, I have brushed against the lemongrass, and does it ever smell divine! I don’t know if it has been effective at keeping undesirable insects from the garden, as advertised, but it sure smells good. We shall see how it fares in a Tom Kha Gai soup once the harvest time is on. 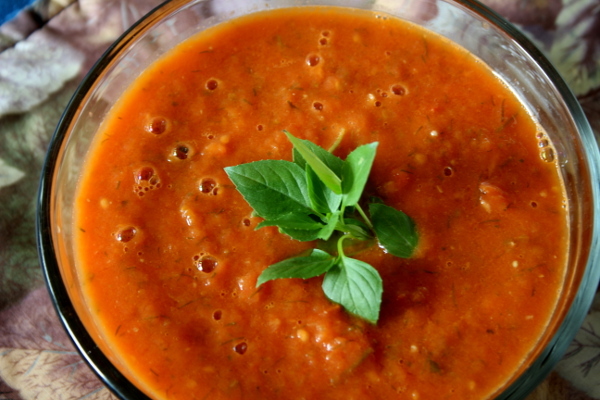 For now, I had quite a few tomatoes to make use of, and so I decided to make a cold tomato soup. My son helped me sort through the tomatoes, keeping the whole ones for future use and getting the split ones washed and cut up for the soup. The recipe is simple, and I just winged it as I went, putting in whatever compatible veggies I had in the fridge. – 2 tbsp balsamic vinegar. I have blended everything together in two batches in my Blendtec mixer, added basil leaves from the garden for garnish and some salt and fresh-ground black pepper to taste. This made a refreshing cold soup for a lazy summer afternoon. In fact, I just had some today for lunch, and I must say – it keeps well in the fridge overnight. So far this summer of gardening has been very rewarding. The last few days have been rainy, so I haven’t been able to do much in the garden except watch things grow. I have been interviewed for the Shop of the Month section on the Keepers of Enchantment blog, have created many a treasury on Etsy to celebrate the summer, and have made some new amethyst belly beads in a children’s size. As I stepped into the fresh wet outside world this afternoon, right after the rain, took a deep breath and looked around, the sun that has finally come out reminded me that it is a warm summer. And every summer I rediscover the refreshing taste of Sangria. I did not have orange juice and citrus fruit that makes up the traditional Sangria, and so I set off experimenting with some peaches, a lemon, a pinch of rose petals, and a raspberry liqueur. The result was surprisingly good. I now have two small 34oz pitchers of wonderfully light, fruity and refreshing Sangria chilling in the fridge (I make two pitchers to use up the entire bottle of wine). The recipe below is for one larger, 68oz pitcher. Adjust as needed. Cut up the peaches and apples into approximately 1 inch chunks. Put the fruit into the pitcher. Slice the lemon and add to the pitcher. Pour the wine and the water over top of the fruit. Add a splash of Chambord (adjust depending on how strong you want the Sangria to be). Add a pinch of rose petals. Add 1 tsp of maple syrup. Stir and refrigerate for at least an hour to let the flavours infuse the wine. Sip with a smile to good music.